Experience the dual relaxation and strengthening that results from the practice of Chen Tai Chi. All classes include gentle preparation exercises to warm up, loosen, strengthen and tone the body. There is also standing meditation to calm down, activate energy and improve posture, and "Silk Reeling" a simple, clear movement and meditation sequence that conveys the most basic elements of Taijiquan body/mind coordination. Leave class feeling rejuvenated and empowered after all of the technique you will learn. 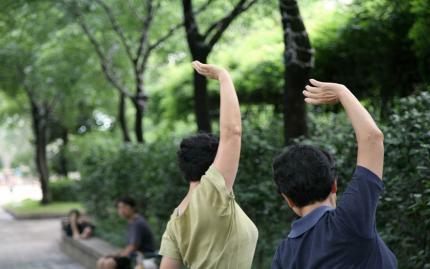 Center your mind and your body in a Chen Tai Chi Class. If you're looking for a calming, peaceful way to improve your mental and physical health, you should take some classes at Embrace the Moon. That's the reason I started coming here. I was on a healing path and needed help and guidance to focus on my wellbeing. It was the right thing to do because I've been learning and practicing qigong here now for the past three years and it's been awesome! It's an amazing dojo full of good vibes and great people. I especially like the 18 Hands of Luohan and Muscle Tendon Changing qigong classes by Kim Ivy and Laura Quandt. For all new students, I recommend signing up for the new student special unlimited pass where you pay one low price and can try as many classes as you want for one month. Kim is a wonderful teacher and the location is beautiful. A must for any taiji or qigong lover!